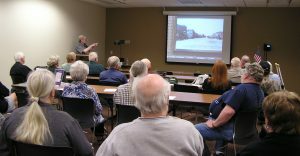 On June 26, 2017, I spoke to members of the Hubbard County Historical Society at the Northwoods Bank in Park Rapids. 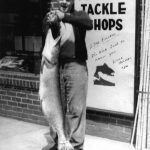 The topic of the program was one that I could relate to quite well: Fuller’s Tackle Shop. The reasons? Jerry Fuller married my sister Betty, and my brother Royce and I both worked for the Fullers in our younger years. 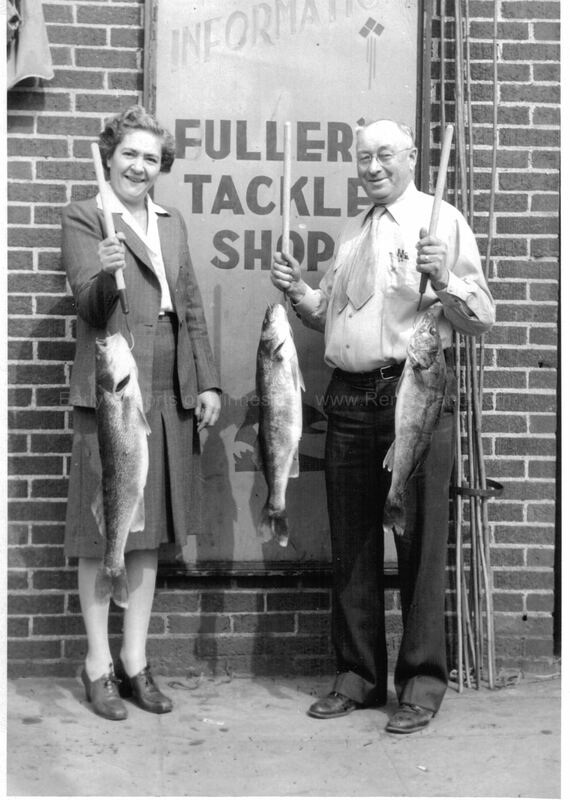 Fuller’s Tackle Shop was not just a store; it was an institution! At it’s peak, before the rise of large sporting good chain stores, Fullers had three locations (Park Rapids, Grand Rapids, and Bemidji), plus a wholesale business that supplied hundreds of resorts and stores throughout northern Minnesota. Fuller’s started in the 1880s as a hardware store, with Frank Fuller becoming an owner in 1891. 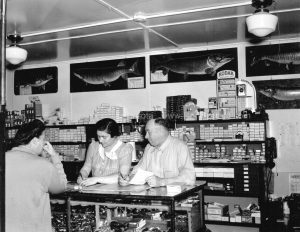 His son, Earl took over in 1913 and the store evolved into something resembling a fifty mile wide, self-styled “Chamber of Commerce” in Park Rapids (In 1930, the Grand Rapids branch was added). 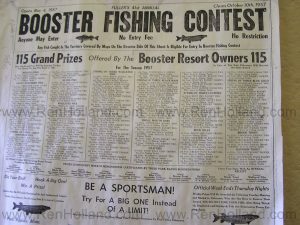 In 1916, Earl had started a fishing contest, and by the 1920s, the hardware store had become primarily known for sporting goods. About that time an organization known as “The Ten Thousand Lakes of Minnesota” began advertising Minnesota as a summer playground. 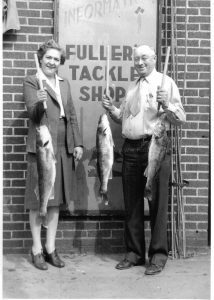 Tourism increased, and so did business at Fuller’s Tackle Shop. 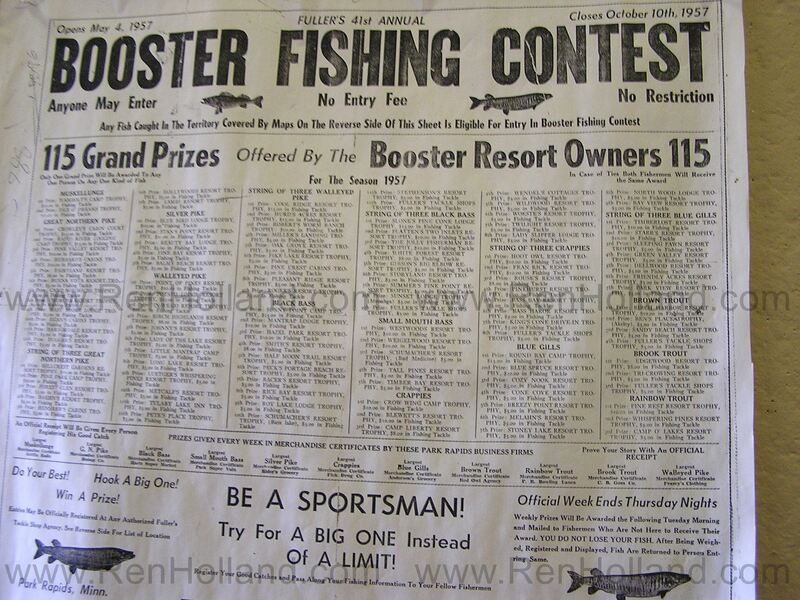 Scattered resorts and country stores within a 25-mile radius, as well as the tackle shop, became weigh stations for Fuller’s Fishing Contest. 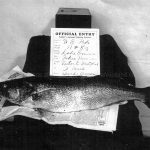 Entrants’ fish were weighed and registered for a publication called the Fuller’s Golden Book. Resorters and businesses contributed money for prizes and ads in the booklet. 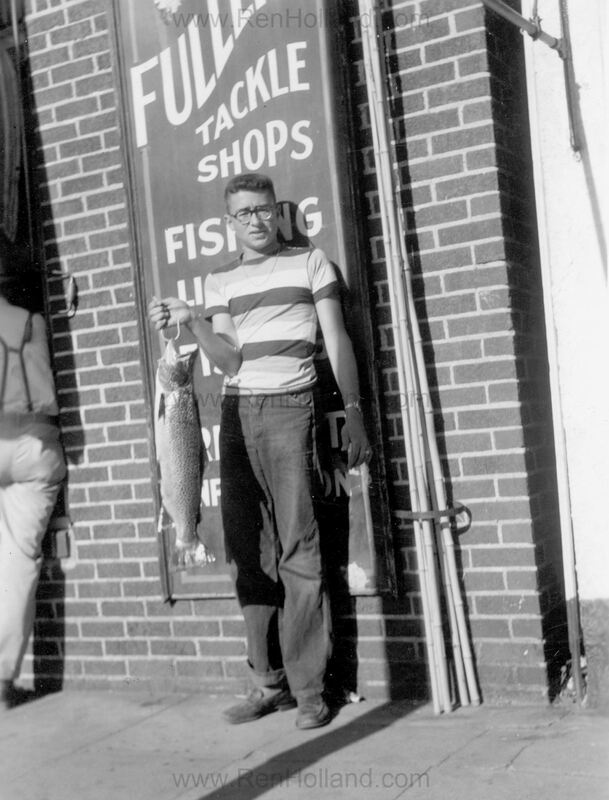 The larger fish were documented on a 9 X 11 inch card and placed in the store’s window. Each entry noted the type of fish, its official weight, where it was caught, bait used, who caught it, their home address, the resort where they were staying, the date caught, and any local guide’s name. The window display of fresh contest fish, spread over chipped blocks of ice, became a focal point for tourists and locals. After a few hours, the fish were removed from the window. The entry card was given to the entrant as a souvenir (click on any photo to enlarge it). By 1949, 25,000 Golden Books were being printed annually, each containing up to 100 pages of resort information, product ads, a fold out area lake map, and hundreds of fish entries. 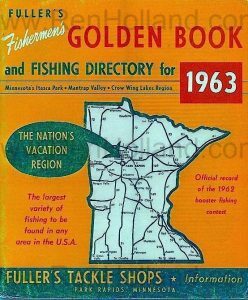 People registered their fish just to get on the book’s mailing list, and planned their vacations around the best resorts or lakes. By 1964, the number of books had grown to 40,000, with nearly 4,000 mailed to contest entrants in 42 states. Bundles of books were shipped to over 350 tourist centers throughout the country. By the early 1960s, Earl and Eugenie Fuller turned the retail business over to their son, Jerry. Earl continued helping into his late 70s in the Fuller’s Wholesale warehouse. Jerry, who began working in the retail store as a young boy, continued the business for another 25 years after taking charge. 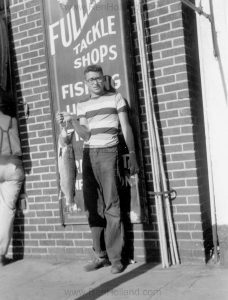 In addition to a daily fishing report on KPRM Radio and participation in numerous local organizations, Jerry wrote a weekly outdoor column for The Park Rapids Enterprise called “Fishing with Fuller” and later “The End of the Line,” which ran for 36 years. In the 1980s the retail sporting goods underwent major changes. Buying habits changed and sporting goods stores became larger and more concentrated; the Fuller stores were sold, with the Park Rapids store eventually being absorbed by Reeds. Our Store was right in the heart of the resort area and we were usually the first stop as we sold the bulk of the fishing licenses in the County. Friday tourists would start rolling in, both returnees and new customers. The returning customers got to be old friends and many of the new ones required maps to get to their destinations, which we gave out by the thousands. We sold Evinrude motors from 1913 until 1951 (They were invented in 1909). My job as a youngster was to break them in as they required 6 hours of running at various speeds before rental. I spent many hours on the river with two and three motors on the boat. We rented them in the summer, then reduced the sale price by half the amount of the rental and kept the motors on stands out in front of the store. Full length cane poles were also stored out on the sidewalk in steel rings, no locks and no problems save for one incident when two fellows had a mock sword fight late at night and broke a few. They came into the store the next morning and paid for them. It was a different era. I doubt that we could do that now. When fish locators (Lowrance) first came out no one knew if or how they worked so we rented them as well. Same story, knocked off half the rent for the sale. Many folks would keep them two or three days and then liked them so well they would buy them. That was a good time for a youngster to be in that business. 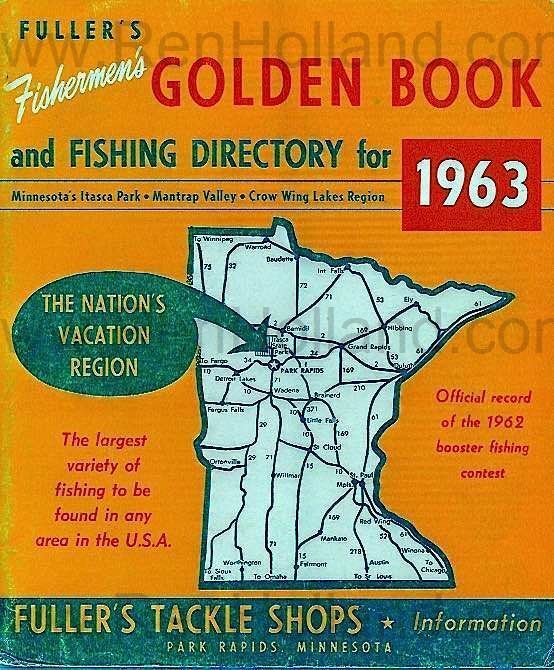 With 70 years of combined ownership of the tackle shop, and continuous publication of the Golden Book, Earl and Jerry Fuller, along with their spouses and employees, contributed more than a giant’s share in publicizing nationwide tourism in Minnesota, especially in the Park Rapids area, and through the branch stores in Grand Rapids and Bemidji. This entry was posted in All blog entries, Minnesota Resorts, Minnesota Tourism. Bookmark the permalink. I weighed in a lot of fish for the window display and made signs as you described. It was too bad people didn’t always pick them up and they had to be thrown away. 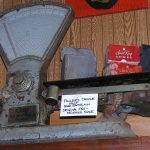 The most exciting time weighing in fish was the summer of the musky rampage on Leech Lake and maybe Winnie. An unbelievable number of muskies were brought in and entered into the Blue Book fishing contest-the Grand Rapids version of the Golden Book. Fullers was often the first stop for tourists from around the U.S. and it was really interesting to note the various locations as I filled out information on fishing licenses. 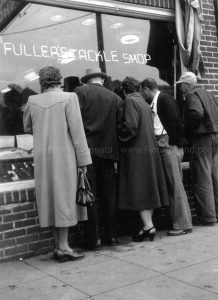 During my last summer or two Fullers I believe the business was sold to Jim Williams and relocated from its long time location on Pokegama Avenue to just a few buildings to the south. It had more space and the business expanded to selling guns and ammunition. It was renamed Rapid’s Tackle.